Print your own full color postcards. Print your own photo or artwork on one side and typeset a personal greeting or event details on the other. You may want us to imprint addresses on your postcards. If so, be sure to upload a spreadsheet of your addresses. 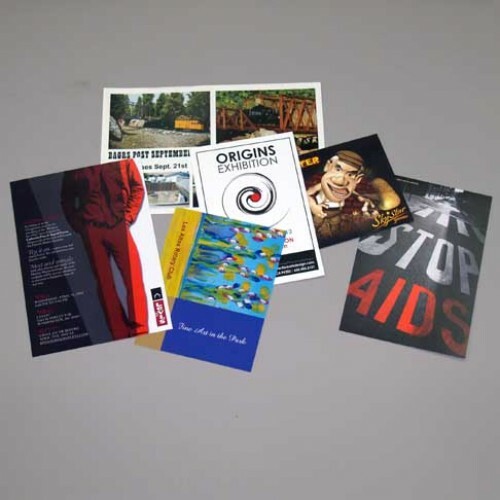 Printed on a selection of uncoated or coated stocks with glossy or matte finishes. Choice of full color, black only or blank for the back of card. Choose from three standard postcard sizes. Send your artwork in PDF format. Check out our file preparation guidelines page for tips on setting up your files by clicking the link below. Please contact us for pricing on custom sizes or larger quantities.